It is not easy to be a yacht designer. It requires advanced technical skills, not to mention a healthy dose of imagination. To create eye- catching modern lines which are also functional is not a simple task. Especially because these examples of technological mastery must move in a particularly demanding environment, the sea, where nothing can be left to chance and everything is the result of complicated, painstaking analyses. And this is the case with yacht interiors, where the designer must develop rational layouts, which are also opulent, responding to the demands of each individual owner, and to complex mathematical formulae. The weights must be positioned, a key factor for optimal sailing performance and yet, at the same time, each interior area must be furnished with materials such as various kinds of fine wood and marble, the specific weight of which is certainly not indifferent. Thanks to the continual evolution of technologies, designers today are able to create luxurious furnishings while containing the weight, by using aluminium honeycomb finished with wood veneer, for example, a solution widely used in the aeronautical field. In short, being a yacht designer is not a profession for everyone and, in fact, the field is occupied by only a few famous firms whose names are passed down from generation to generation. In England, the home of numerous famous shipyards, Bannenberg is a name which has been at the forefront for more than 40 years, ever since the firm was founded by Jon Bannenberg. Carrying on with the founder's innovative spirit, today the company is led by managing director Dickie Bannenberg, in collaboration with the creative director, Simon Rockwell, and the project manager, Alex Isaac. And Bannenberg creates both interior and exterior designs. Indeed, it does this so well that it has become famous in the most "in" speciality in the sector. What is more, its fame is not limited only to the nautical field but extends to the building sector also. 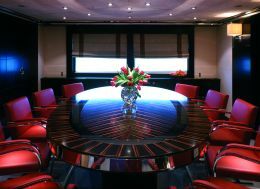 As far as super-yachts are concerned, the Bannenberg workshop has worked for many illustrious clients, including Italy's Benetti and the Dutch firm, Feadship. The English workshop's most recent work, completed this year, was the partial restoration of the 52-metre "Illusion" for Feadship. "Illusion" was launched in 1984 and Bannenberg completely redesigned the owner and guest cabins, renovating the interior furnishings, an undertaking which involved the installation of new lighting systems and the renovation of all of the wooden fittings. The refit, done in quite a short period of time, between the end of 2004 and 2005, began with an analysis of the arrangement of the interiors, which were redesigned using sophisticated 3-D software. The designs were then shown to and accepted by the owner. 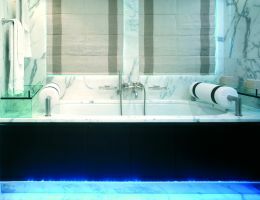 The renovation of the areas reserved for the owner and guests included the installation of a new audiovisual system, entrusted to Audio Video Concepts and Design of Seattle, and major restoration of the carpentry, upholstery and furnishings, in which the German firm Metrica was involved. The result is warm- looking areas in which noble materials, such as wengé, teak and soft leathers, stand out. 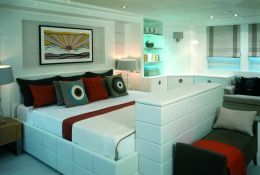 The major changes were made to the owner's suite, which now has new white walls, a colour also chosen for the leather and suede throughout the ship. 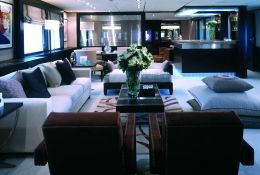 For the renovation of the furnishings, leather and various accessories, Bannenberg consulted the catalogues of famous interior-design firms, such as Julian Chichester, Fake London, William Yeoward, DeLaCuona, Porta Romana, Ecart and Viaduct. The result is the perfect marriage of the maritime spirit of "Illusion" and the prerogatives of an ideal living space. For further information: Bannenberg, 6 Burnsall Street, London SW3 3ST; Tel. 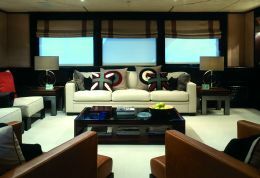 : +44 (0)20 73524851; Fax: +44 (0)20 73522844; Web site: www.bannenberg.com; E-mail: yachts@bannenberg.com.